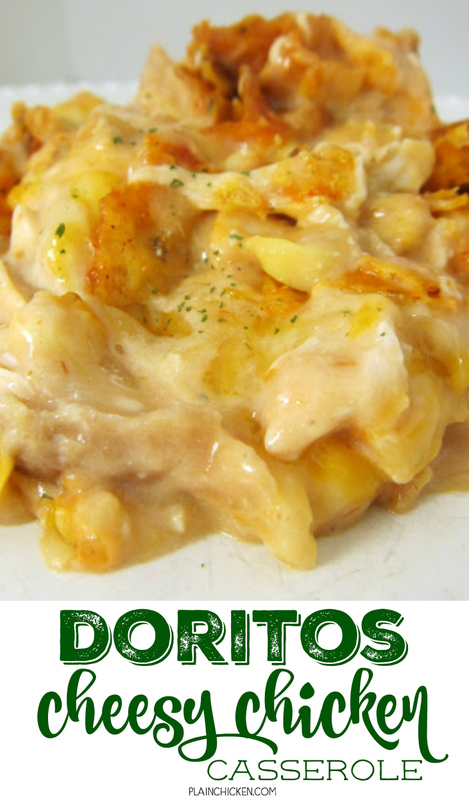 Doritos Cheesy Chicken Casserole - THE BEST Mexican casserole EVER! Chicken, sour cream cream of mushroom, cream of chicken, salsa, corn, cheese and Doritos! Everyone goes nuts over this casserole. Only takes a minute to assemble and it is ready to eat in 20 minutes. SO quick and easy. Great for a crowd - even picky eaters love this! This recipe is from Plain Chicken reader, Diane Blake. She was kind enough to share her favorite recipe with me. I've never made a Doritos Cheesy Chicken Casserole, so we gave it a try. This is one of those dishes that isn't pretty, but it tastes really good. We both really enjoyed this. I used some rotisserie chicken meat and this came together in no time. We both especially loved the Doritos! Chicken Legs topped his plate with extra Doritos, because you can never have too many Doritos. We make this all the time (without the corn, though) and I LOVE it!!! Definitely not a pretty meal but soooo good!! i was wondering about the corn,thanks!! My girls would absolutely adore this dish! You have so many recipes on your blog they I know they would love. I'm going to have to cook my way through your blog! Not that I am, but I always had a running joke with a couple of my friends ..... that if I ever went to prison, they would have to send me doritos once a month. You can guess that means they are my favorite chip. Actually, this is such a cool idea. I'm always looking for ideas to incorporate my favorite junk food into meals, because if I do, then it technically won't mean that I'm snacking, which makes the whole process legal, right? My family really enjoyed this! I made this on Friday - YUM! The best part was just how EASY it was to make. Thanks! I want to make this! NOW!!! FINALLY! Something that my 3 yr old will eat without a battle! Making this tonight!! Excited to see how it turns out! I plan on making this tonight but what size bag of doritos needs to be used? America! Dumb autocorrect! Good luck! LOVE this recipe! So quick and easy to make. Love this recipe! We used canned chicken and omitted the cream of mushroom for an extra can of cream of chicken its so good! It's on my favorites now and I've gotten requests on Facebook so I shared this! Thank you for posting this! Step daughter was here for spring break and one of the days I made this recipe. She had fun bashing the bag of Doritos to make crumbs! Everybody loved it and I'll make it again for sure. I dont have any nacho doritos on hand but I have cool ranch. What do you think of using those instead? Has anybody tried it? Steph, I found your site after choosing several recipes posted on Pininterest.com after saving quite a few recipes that looked solo yummy, discovered most of them came from your site. The photos is what really drew me towards them. I love to cook with my 10 year old Granddaughter! Night before last she made the Dorito Cheesy Chicken Casserole with very little help from Grandma. She was so pleased when everyone had seconds and told her how good it was. She decided to omit the corn as its something I can't have and she topped it with sliced black olives. Will definitely have this again at our house. I might add we have also made the Cinnamon Roll Pancakes and the Cheddar Bacon Ranch Pull, she loves telling everyone how yummy they both were. She has found several recipes you have posted that she wants to make, just having a hard time deciding which ones as there are so many that look and sound good to her. Can't wait tonsee what she chooses! We Love your site!!! My son loves Doritos so thought I would give it a try. Everyone loved it, even my mother who didn't think that she would (she's picky). Thanks! SO glad your mom liked it too! Based on the chips, can soup and sour cream you can assume the nutritional value is high sodium, high fat. But that's also why it is so delish!!! I made this for lunch today & my kids & husband gave it a 9 out of 10. They loved it! I used sharp cheddar, rotel tomatoes & sprinkled some chips on top around the edges with the additional cheese in the middle the last 5 min. I thought the chips on bottom seemed a little too done. Thinking of mixing it all together next time so the chips get a little more soft. We liked it though. I made this and it was good, but not my favorite of all of the recipes I've tried from you (which are all wonderful). I used the amounts you said, but I think there were too many chips and too much cheese. Aside from the cheese overload, the flavors went well together. I'm going to tweak it a bit the next time I make it. Thanks for the recipe! Can you make this ahead and freeze it? I'm making it for a new mom and want her to be able to use it when she needs it! You can make this ahead and freeze it. I would add the chips right before baking rather than freeze them. I think this is a pretty recipe. Add some green onions and chopped tomatoes to the top would make it even prettier. I made this tonight! It is in the oven as of right now :) The only thing i did differently was add some onions; I also layered it by putting the Doritos then chicken mixture then Doritos until i reached the top. Hope it turns out yummy :) Thanks for the great recipe! Don't the chips get soggy on the bottom? This recipe sounds good, but I would think it would work better to put the chips on top so they would stay crispier? Eryn Ann - the chips didn't get soggy when I made this dish. If you try the chips on the top, let us know how it turns out! While visiting my family in the south my step-mother made a dish very similar to this one and I have been searching for the recipe for years. Hope this is it! What exactly is Mexican cheese? Velveeta or some type of hard cheese? At the store now buying the ingredients! Love love love! We did as the recipe reads, using rotel mild, and putting some of the dorritos on top, and it was delicous! I am a pretty picky eater, but this will definately be added to my recipe book! Thank you for the recipe! But is it suppose to be semi-watery? And the can soup kinda made it a little too salty, what can I do to make it less? glutenfree - I usually use the Healthy Request soups - they have lower sodium. My casserole wasn't watery. It will just depend on they type of salsa you use. Try a chunky salsa next time. Thanks so much for the advice, Stephanie! Love your site, all the best!! My hubby doesn't like sour cream. I don't think he would taste it in this, but could I omit or sub this for something else? Michele - you can't taste the sour cream in this dish. You could substitute Greek yogurt if you didn't want to use sour cream. The only size bag at my grocer was 11 ounces. I hope it is the correct size. If you put the doritos on top they burn! Dave - I put the Doritos on the bottom. I was really excited about trying this. I made it tonight, and didn't change a thing. I didn't like it much. I think the cream of mushroom soup was too much. If I try making it again, I won't add it. I made this last night and we liked it for the most part. A few of us didn't like the spice of the Rotel (I used mild), so would try again with the salsa instead. I made this yesterday & it was pretty good. I substituted crushed tomatoes, which we like better than dice, but added an axtra cup of cheese, to try & firm it up. It didn't really work as far as setting it up better, but it was very good none the less. Iused a couple of chicken breasts, which I cut up & browned in a skillet. I have a few pics on my profile page. Good recipe. I grew up eating this in the 80's and 90's how weird that it is on here haha. This stuff was even better reheated the next day. I also make something similar. I don't use corn or CO Mushrooms. I Use Velveetta melted into homemade CO chicken. This so so good. My whole family loves it. Has anyone tried adding green beans to it? I was using left overs so changed it up a bit. This was a wonderful, quick and easy meal that even our almost 3 yo ate. This was fabulous! It was a great change of pace for our family's traditional casserole recipes. I loved having the crunchy chips on the bottom. The only issue is that it doesn't reheat well because the chips become very soggy. But I just added some more crunchy ones to the top and it was great! Quick question?! do i drain the corn or just throw it all in there? Any idea how this would work with ground turkey instead of chicken? I wonder how much you would use? Any idea if this would work with ground turkey? And how much you would use? You could certainly try it with turkey. I might try it with 1.5 pounds of ground turkey. How would this taste if I skipped the salsa/tomatoes? Also, I've read a lot of comments about how runny it is. Would I be better adding noodles or cutting the cream of mushroom in half? How would this taste if I skipped the salsa/tomatoes? Also, I've read a lot of comments about how runny it is. Would I be better adding noodles or maybe cutting the cream of mushroom in half? I think it would be a little bland, but you can certainly make this however you wish. In your recipe did you use shredded chicken? I usually use chopped rotisserie chicken or chopped cooked chicken breasts. Ok, because all I had was boneless skinless chicken breasts so I just shredded it... hopefully it'll work. It will be just fine! Enjoy! I had to cook mine longer than 20 minutes to get everything heated through. Other than that, very good! Easiest to make and we literally inhale this stuff! Best recipe!! !